As condo towers continue to sprout up at every corner of the city, a group of University of Toronto students and faculty members are trying to ensure that, on a small stretch of Yonge Street, city infrastructure catches up with the upward growth. Today, Toronto city council will vote on a proposal to reduce the six-lane stretch of Yonge Street between Finch and Sheppard Avenues by two lanes, adding bike lanes and widening the sidewalk, which advocates say will improve safety and walkability. This stretch of Yonge has seen 78 collisions involving pedestrians and five involving cyclists in the past eight years, with eight collisions involving fatalities or serious injuries, according to a study by Toronto Transportation Services. Mayor John Tory, however, is not in support of the plan. He wants to keep the six lanes and add a bike lane on an adjacent street. In response to Tory’s alternate proposal, a group of prominent city builders, including Jennifer Keesmaat, former chief city planner and U of T urban planning instructor, and Richard Florida, a University Professor and the director of cities at the Rotman School of Management's Martin Prosperity Institute, signed an open letter in support of the original “Transform Yonge” proposal. “Reducing one lane of traffic in each direction allows for expanded sidewalks, greenery, and more space for patios and public life. Bike lanes are part of the package but aren’t the impetus,” the letter says. Yonge Street is in many ways Toronto’s main street, says Florida. That’s why there’s a need for revitalization, says Florida, adding that there are many great commercial establishments and residential neighbourhoods along Yonge. Planning master’s students in the Faculty of Arts & Science have also decided to advocate for the Transform Yonge proposal with a website dedicated to the proposal and two petitions: one aimed at the public and one aimed at urban-focused students. The petitions have received over 350 signatures so far from faculty and students at U of T and other academic institutions across Ontario, as well as from residents of Toronto and surrounding communities, and even some signatures from Montreal, Vancouver and Switzerland, says Anson Ma. Ma and five other students in Keesmaat’s planning course decided to come together to create the petition. “It just made sense that we should be creating streets that are more livable, more accessible, safer, and friendlier for residents of our city,” says student Igor Samardzic. 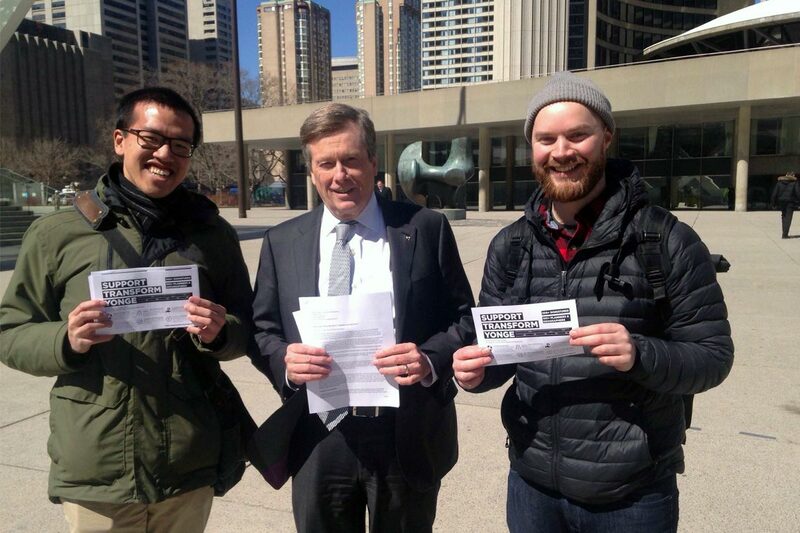 On Monday, some of the students behind the website and petitions hand-delivered the petitions to Mayor Tory at City Hall. “He did take the petition and said he would read it and appreciated us coming,” says Pye.